The Missouri Good Neighbor Award program was created to recognize and reward REALTORS® across the state for their dedication to volunteer service. 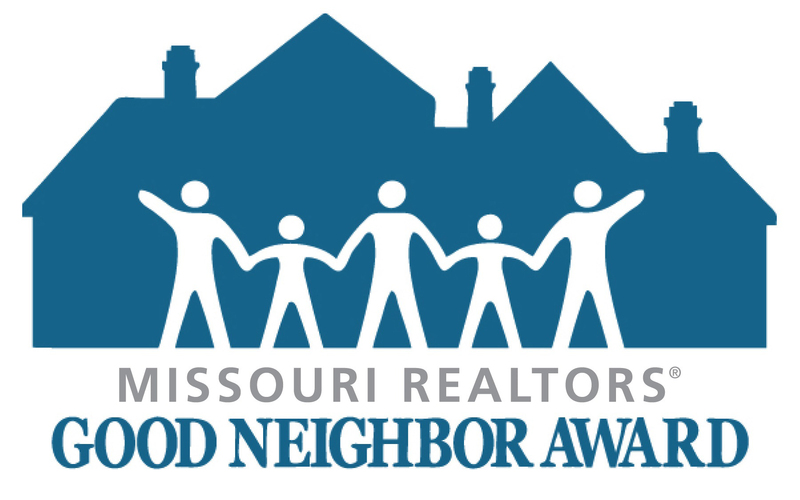 The Missouri Good Neighbor Awards program is modeled after REALTOR® Magazine’s Good Neighbor Awards. The winner of the annual Missouri Good Neighbor Award receives $2,500 for his or her charity, as well as statewide recognition. The 2019 Missouri Good Neighbor Award nomination deadline is September 1, 2019.
Who can nominate a Good Neighbor? Anyone can nominate a Good Neighbor—common examples include the nominee's broker, a colleague, a spouse, or a representative from the charity or real estate board. Many candidates nominate themselves. The nominee, however, must be a REALTOR®, that is, a current member in good standing of the local REALTOR® association and Missouri REALTORS®. Yes, in fact, we encourage you to. Though some people aren't comfortable "selling" themselves, you are uniquely qualified to share the details of your experience with us. If you do nominate yourself, we encourage you to provide at least one testimonial letter from someone else who is familiar with your volunteer work--these testimonials usually speak in more glowing terms than you would use to describe yourself and provide insight into how your work is viewed by others. Can a group be nominated? Though there are plenty of deserving groups, this award is specifically intended to recognize individual REALTORS®. The only exception would be if two people—such as husband and wife—work together equally on a project. If their work truly cannot be separated, they can be nominated together. However, keep in mind that the judges will be comparing them with individual candidates. Generally, it is advisable to designate one person as the nominee, if possible. Am I eligible if I volunteer for more than one organization? Absolutely. It is common for volunteers to be involved in more than one area of community service. If you would like to be considered based on your work with several charities, include the information on the nomination form (attach additional pages if necessary). One word of caution: Quality is more important than quantity. Generally, the more organizations you include, the harder it is for judges to determine the impact you have made, so it's often better to limit the details to only the organizations for which you have made a significant impact. How can I make my nomination stand out? Be as specific as possible. For example, give a close estimate of the number of hours volunteered, the number of people the nominee helped, the number of dollars raised, etc. Vague words like "countless" "incalculable" or even "thousands" are of very little use to the judges. Don't rely on adjectives. Superlatives like "kindest", "most dedicated", "most generous"—though certainly true— don't help the judges evaluate a nominee's achievements. Instead, describe something the nominee did that illustrates how kind or dedicated he or she is. Focus on your accomplishments, not the organization's in general. The judges need to evaluate the impact that the nominee has personally made. Don't make the mistake of only emphasizing how much good the organization has done; instead, focus on what the nominee has done for the organization. May I send a video with my nomination? You may send videotapes or DVDs, but we discourage it. With the amount of materials the judges need to review, we can't guarantee that audio-visual materials will get full attention. If you feel the content of a video is truly important and not covered elsewhere in your nomination, please consider sending a written transcript of the video. The judging will be finalized in October. The winner will be announced at the January Business Conference and will be featured in Missouri REALTORS® member communications. The winner will receive a $2,500 grant for his/her charity, statewide recognition through a general statewide media campaign, and along with his/her charity, will be featured in a customized video. The recipient and a companion will receive expense-paid lodging to the January Business Conference for the awards ceremony. May I fax or e-mail my nomination? For more information regarding the Missouri Good Neighbor Award contact us at missourirealtors@morealtor.com or (800) 403-0101 x.117.